There are a variety of things to do near Portland, Oregon. It’s hard to narrow down what to do while in Portland because the area offers a vast array of outdoor fun. The attractions in the Portland area appeal to all ages. 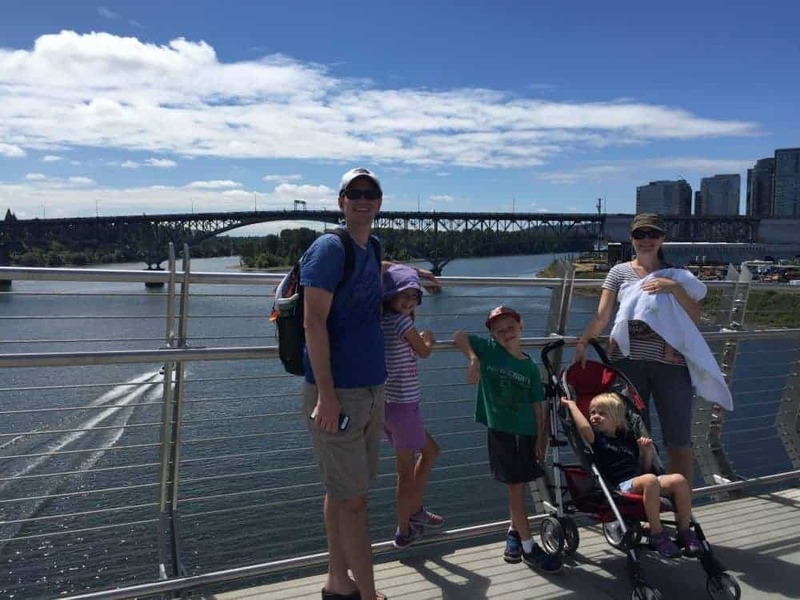 We spent five days enjoying various adventures in Portland, Oregon with our kids – ages 9 months to 9 years – and several of their cousins. Use our Travel Guide for Portland, Oregon with kids that include family friendly hikes, parks and things to do in Portland. 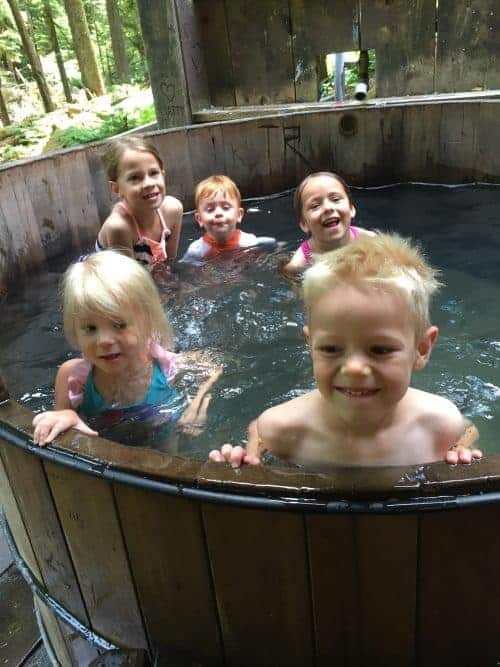 Our favorite activity in Portland, Oregon with kids is hiking to Bagby Hot Springs. The hike is about a two hour drive outside of Portland, and the drive is beautiful. It winds through the mountains and leads to an easy, 1 mile hike in the woods. And these aren’t just any woods. The amount of green in the area was astonishing – green trees, green ground cover, green moss, and to top it off, there were fairies visiting the area (glitter bombed tree stumps). The entire hike was just magical. At the end there are changing shacks and bathtubs ready for piped water from the hot springs. The water is so hot you have to add buckets of cold water from a different spring. It was fun to bathe in the middle of the woods! Bring a change of clothing if you don’t want to hike a mile back in a wet swim suit. 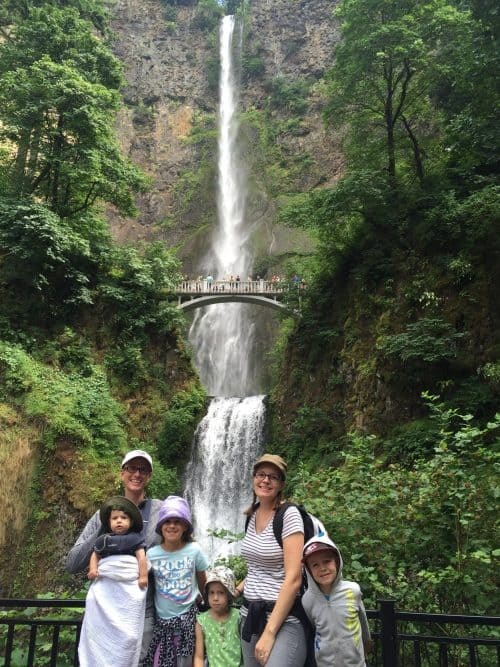 One of the most famous hikes in Oregon is Multnomah Falls. It’s only about 30 minutes away from Portland. You can take a short walk up to the base of the famous falls, a slightly longer walk to the bridge in front of the falls, or hike a mile straight up the mountain to the top. The views of the Columbia River from the top of the falls are unbeatable, but it’s debatable if it was worth carrying my 3 year old up the steep climb. One of the most fun places to go in Portland is the Mt. Hood Adventure Park. It’s not unique in the activities there, but it IS unique in its beautiful view of Mt. Hood as you careen down the alpine slide. There are also kiddie rides, a ropes course, ziplining, and bungee jumping (which I can’t 100% recommend! Yikes!). This Portland attraction is a fun way to spend a day. 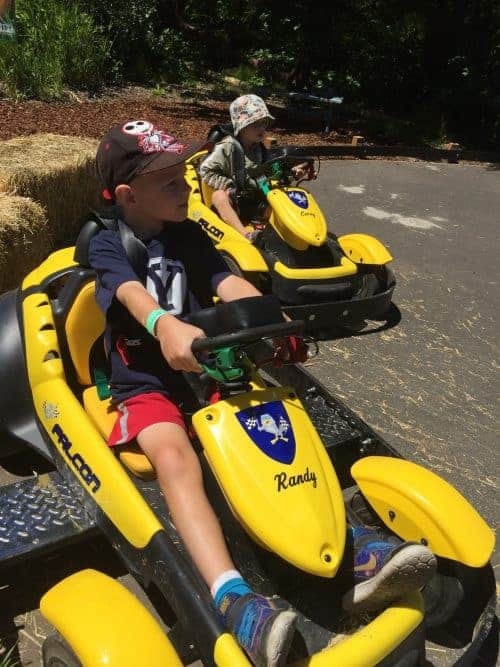 The adventure park is just over an hour drive outside of Portland. Washington Park is a Portland attraction with many activities. Walk along the trails to visit the zoo, children’s park, children’s museum, Japanese Garden, arboretum and rose garden. We chose to walk around the Japanese Garden for our first visit to Washington Park. It was a bit too solemn for our energetic kids, but the adults in our group enjoyed the landscaping and the interesting facts we learned. Our next visit included a trip to the children’s park (basically a very large playground), to get some energy out, and the little ones were much more interested in that. Get around downtown Portland by walking and using MAX light rail. Exploring Portland, Oregon with kids is easy because it’s a pedestrian-friendly city. The only place we had trouble with strollers was the Japanese Garden, and that was mostly due to construction. It’s nice to simply walk from place to place rather than loading kids in and out of the car at every stop, and having to worry about parking. We took the tram up the mountain for the view of Portland down below, and walked across the Willamette River on the nearby Tilikum Crossing, a bridge solely for pedestrian and public transit use. Great views were seen from both! 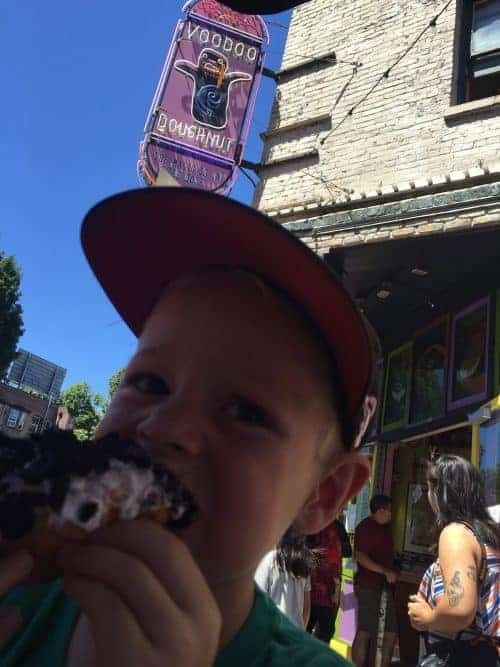 If your kids are young enough to overlook the innuendos – or old enough to laugh at them with you – a trip to the famous Voodoo Doughnuts is a must. We waited in line 20-30 minutes to try several different unique donuts. The grape soda one was my favorite. The food trucks in Portland are really more permanent kiosks than the food trucks I’m used to in Southern California. They are set up in vacant lots throughout downtown and there are dozens of options at each. The best part was we could find food to please the picky eaters, as well as more adventurous and local fare for the rest of us. We took food truck purchases over to the waterfront park to enjoy the view. A festival was being set up (very common) and there was a lot of see and do while we took a rest and ate lunch. Spend some time familiarizing yourself with the MAX light rail, or mapping your planned walking destinations. If you don’t have little kids, biking is also a great way to get around Portland. If you or your little ones get car sick, be sure to plan ahead. The drives outside the city are mountainous and beautiful, but very windy and not ideal for sensitive tummies. A load of laundry each night keeps our suitcases half as full, and allows us to bring gear for all the different activities we did – hiking, swimming, being prepared for heat or rain. Plus, this is Portland – you can always just run to Target if you forgot something. Keeping everyone happy in the car is essential. Plan ahead and be prepared with the items you need when driving in the car with kids. Don’t forget to include toys for the kids that are perfect for traveling. As usual, we recommend an Airbnb or hotel suite with a kitchen. We shopped at the grocery store, made dinner at home most nights, and packed lunches to take on our hikes and adventures during the day. Here’s a $40 coupon for Airbnb or use Hotels.com. If you get the chance to visit Portland without kids, there are 10 Unique Hotels in Portland you should try! If you’re looking to extend your travels in the area, there are 11 places in Oregon to visit and also many things to do near the Oregon Coast. Or take a family road trip a bit farther to the north. There are lots of things to do with kids in Vancouver, Canada. Use this John Day Fossil Beds National Monument Guide to find solitude and get away from the crowds in central Oregon. Thank you! The whole facility built around the hot springs is wonderful. Very convenient, but blends right into nature. Ha, I’ve never been to a hot spring where the water was put into tubs! That looks like so much fun. And of course, who would ever want to miss out on driving a go-cart (big kid here). I must say that I loved your opening photo with the lighthouse. Lots of great advice here. Pinning to my family travel board. It was such a clever way to make the hot springs into a tourist destination. We loved it! It’s great to see that there are so many outdoor activities that can be done just outside Portland. I love hiking so going to the hotsprings would be a must for me, especially that after the 2 hours hike you get to sooth your muscles in the hot water. The Multnomah Falls it’s also a must, I don’t think I have ever seen such a tall waterfall! 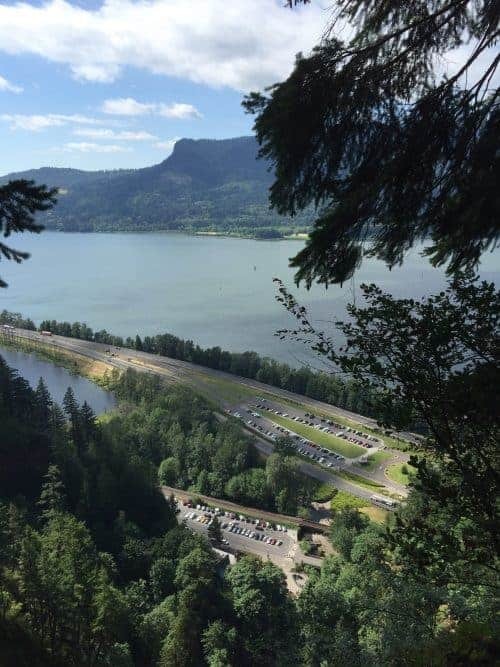 You should definitely hike to the top of Multnomah Falls. It’s a fun hike, steep but pretty short, and the views are incredible. There are lots of activities to do in Portland with kids. 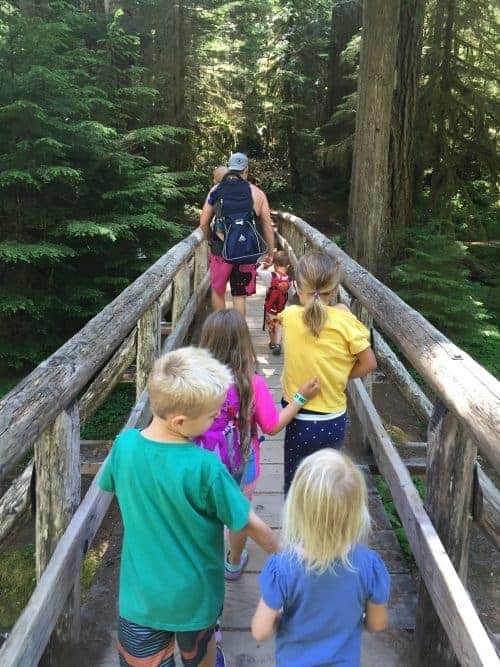 Hiking to Bagby hot springs must be a beautiful hike as it surrounded by nature. Your kids looks happy in hot water bathe. Multnomah Falls looks stunning and picturesque. My kids would love Mt. Hood Adventure park as they love all adventure stuff. 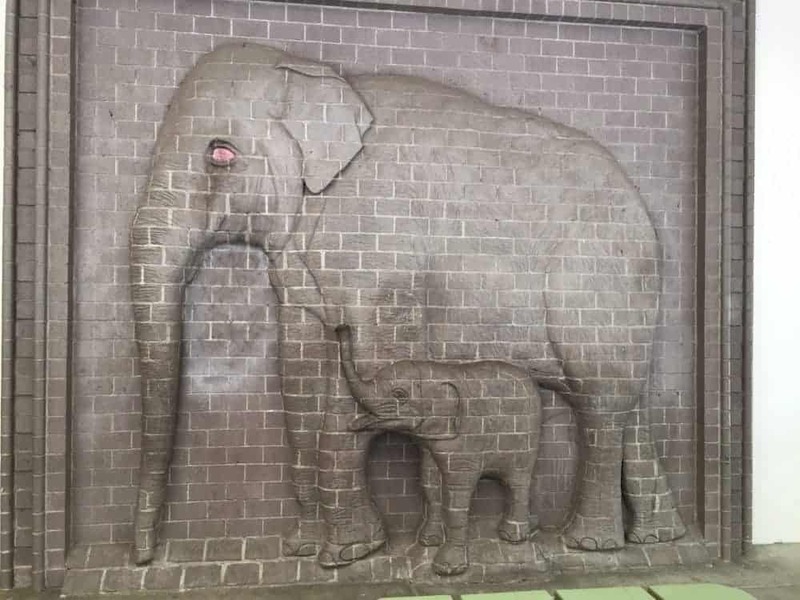 Great place and that too kids friendly. There was a ton of things to do in Portland with kids! We were there five days and couldn’t do them all. I am so so looking forward to Oregon! I have heard so many great things about this state! And your list of activities to do with kids is perfect for us because we will be traveling with our three years old daughter. Hiking to the Bagby hotspring following by eating donuts at the Voodoo donuts would be a perfect day for a family outing! Do you have a trip planned? Let us know what else you enjoy in Portland with your daughter. How old is your son? We have four kids of different ages and they all had a blast in Portland. Being someone who almost always travels with kids this is extremely handy. Portland looks like a great place to visit with kids and it’s nice to see so many varied options for them to enjoy. Being a huge advocate of Food Trucks I can see there is something that will keep me happy as well. Thanks. There were so many food trucks! There were lots of them throuought downtown, each with dozens of food options. It was food truck paradise. This seems to be such a beautiful place. And perfect for daytrips especially with kids. I think especially for children it is important to get in touch with nature, being surrounded by green and fresh air. The Washington Park also looks very nice, but I think my personal highlight would be taking a bath in a tub in the Hot Springs, this must have been fun! The hot springs were awesome! You’re right, there were so many wonderful day trips out of the city to visit and hike in nature, it was perfect for exploring with kids. I would love to do the hike to Multnomah Falls! It looks breathtaking from all of the photos I’ve seen. Such a fun list of activities including the voodoo doughnuts and the food trucks. 😉 I’m sure your kids had an amazing time! Multnomah Falls, and the view from the top were definitely awe-inspiring.